LMPD Detective Brad Woolridge and his son Braden participated in the 50th Anniversary Final Leg last July in Chicago. Kentucky is sending two gymnasts and a coach to the 2019 World Summer Games in Abu Dhabi, but they won’t be the only ones representing Kentucky at the Games. 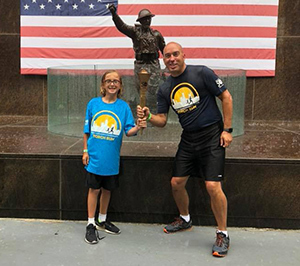 Louisville Metro Police Detective Brad Woolridge is the state’s representative at the Law Enforcement Torch Run Final Leg that leads up to the Games. Woolridge is an 18-year veteran of the Louisville Metro Police Department and has supported Special Olympics Kentucky as a volunteer for 16. He is a staple at events of all kinds, both competitions and fundraisers like the Polar Plunge and UPS Plane Pull. Woolridge has made Special Olympics a family affair with his wife and two sons volunteering with him whenever they can. While Woolridge has run in countless local Final Legs, this will be his first World Games Final Leg experience. He also participated with his son Braden in the Final Leg that carried the Flame of Hope to the Special Olympics Eternal Flame at the Special Olympics 50th Anniversary Celebration last July in Chicago. Woolridge will run with Team 8, which includes nine officers from four countries along with one Special Olympics USA athlete. The Final Leg will kicked off in Abu Dhabi on March 3 and travel throughout the United Arab Emirates before returning to Abu Dhabi for the World Summer Games Opening Ceremonies on Thursday, March 14. There will be 110 law enforcement officers from 24 countries participating in the event. He will be posting photos when possible to the Kentucky Law Enforcement Torch Run Facebook Page throughout his trip. The 2019 Special Olympics World Summer Games will be held March 14-21, 2019, in Abu Dhabi. It will be the first time the World Games have been held in the Middle East. The Games are expected to bring together more than 7,000 athletes from 170 countries to compete. This will be the fourth time that the World Summer Games have been held outside the United States. The others were in 2003 in Dublin, Ireland; 2007 in Shanghai, China and 2011 in Athens, Greece.